South African bantamweight Zolani Tete has always had serious knockout power. He started his pro career off with seven straight knockouts, and now he holds the all-time record for fastest KO in a major title fight. 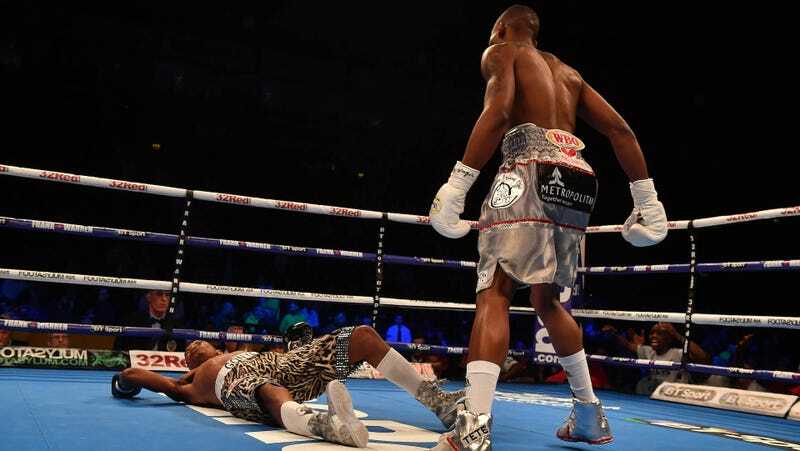 Tete put the WBO bantamweight belt on the line against fellow South African Siboniso Gonya in Belfast on Saturday, and he stopped Gonya with the first punch he threw at him, winning by knockout (duh) just 11 seconds into the fight. It’s the fastest-ever knockout in a WBC, WBA, IBF, or WBO championship bout. Gonya appeared to be all the way unconscious after the hit, which was too fast to see at full speed (thanks mostly to the camera switching angles at the wrong moment). Upon replay, you’ll notice that Gonya drops his hands and walks straight into a full-bore right hook, unmooring himself from the waking world. Maybe next time.